Sprinkled throughout Mammut’s info about our avalanche transceivers is the phrase “fleet management”. Many people, including some who manage a fleet of beacons, are not familiar with this term, even though they are already doing it in one form or another. Hopefully anyone who owns and manages a fleet of avalanche transceivers is already keeping an inventory of what they have, knows when each unit was purchased, is regularly verifying the equipment is up to date and safe to use, and is aware of and keeping track of any problems—this is Fleet Management. As the size of a fleet grows, or as the available time of the manager is stretched (or both), this essential safety and liability-management process too-often is a casualty. Mammut offers several tools to assist fleet managers or “institutional users” with this task, which we hope serve to make their lives easier and serve to increase the level of safety and service offered by our products. These are ideal tools for beacon fleets for custom beacon configuration, troubleshooting, periodic upgrades and to record regular maintenance for management and liability purposes. For this explanation to make the most sense, it’s useful to be clear what the difference is between FIRMWARE and SERVICE SOFTWARE. Firmware is the program that is installed in an avalanche transceiver. All Mammut Avalanche Transceivers utilize an upgradeable platform that allows for periodic firmware updates to extend the lifespan of the product by introducing new features and improvements. 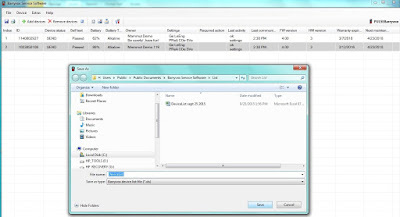 Service software is the program that is installed on a PC--sorry, they are not compatible with Macs--that, in combination with a W-Link Stick or Tester fleet-management tool, allows for firmware upgrades, beacon configuration, fleet management, functional testing and record keeping on one or a fleet of beacons. 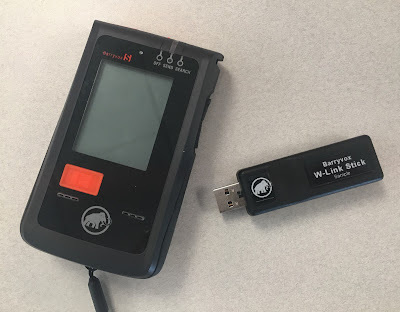 Mammut makes 2 different Fleet Management Tools: the W-LINK stick 2.0 (sometimes called a w-link adaptor or “dongle”) and the BARRYVOX TESTER 2.0. The W-link stick 2.0 allows custom configuration of BarryvoxS or Pulse transceivers only (the standard Barryvox and Element have a fixed configuration) as well as daily self-checking and record keeping functions and beacon firmware upgrades, all on one or multiple beacons simultaneously, using wireless “W-Link” communication. The W-link Stick 2.0 is the tool most small to mid-size organizations use as part of their risk-management plan for their client or employee beacons or for retail shops who manage a rental fleet. The Barryvox Tester 2.0 performs all of the same functions as the W-link stick in addition to a full diagnostic functional test of all beacon functions. note: In Fall of 2018 Mammut will introduce the W-link Stick 2.0 and Tester 2.0 along with service software to run them for the new generation Barryvox and Barryvox S transceivers. The 2.0 versions will also perform fleet management functions with older Pulse and Element transceivers using a different service software, but will not be able to perform firmware upgrades on the older beacons. 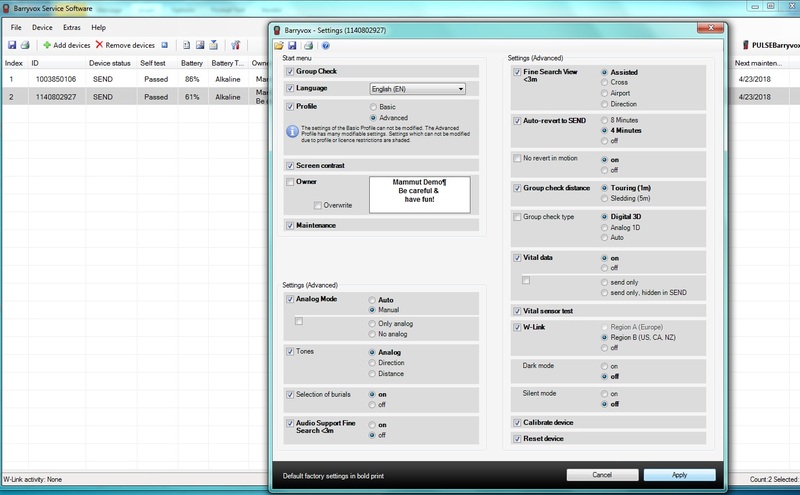 Note that the Tester 2.0, unlike the original tester, does not require periodic recalibration. Please contact us for further compatibility questions. The purpose of the fleet management tools is to make it easy for organizations to document the safety of their equipment and ensure a high level of client and employee safety. The following functions are all designed as an aid toward achieving these goals. 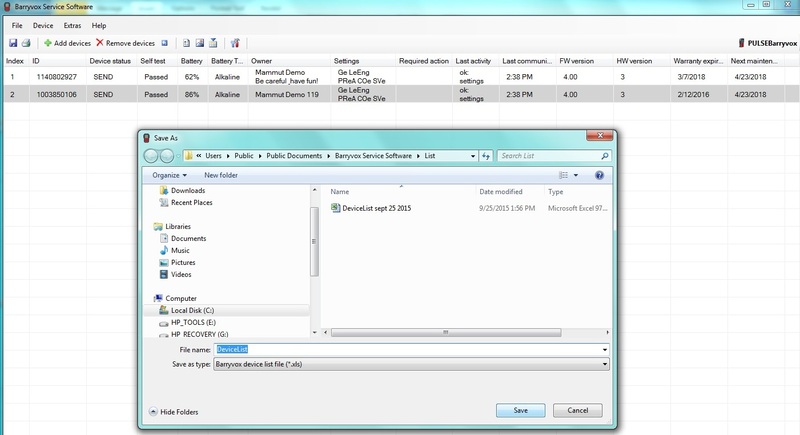 The device list showing all beacon info, and a save window to make an excel document recording this check. The settings menu allows easy and fast configuration of one or multiple beacons simultaneously, and also allows the settings to be locked in place if desired, to ensure all devices are the same for standardized training. 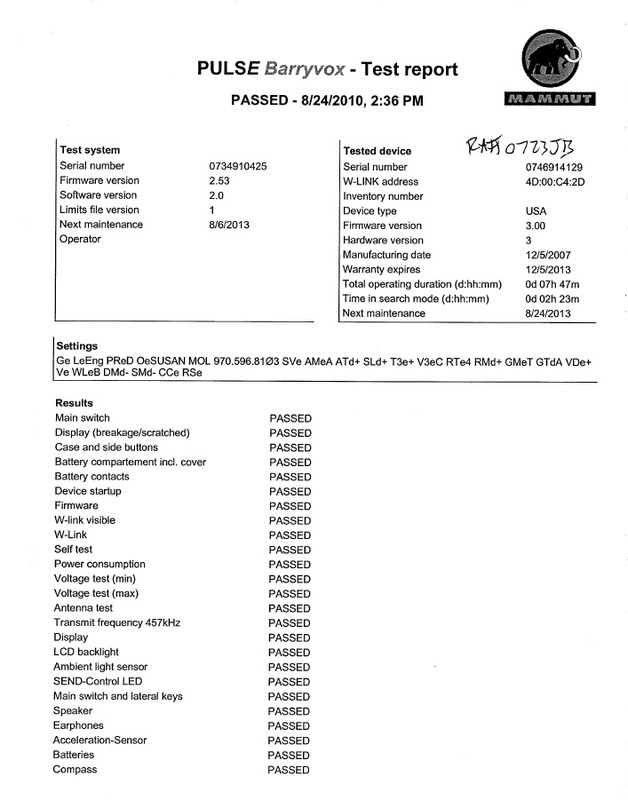 Example of a beacon test report. 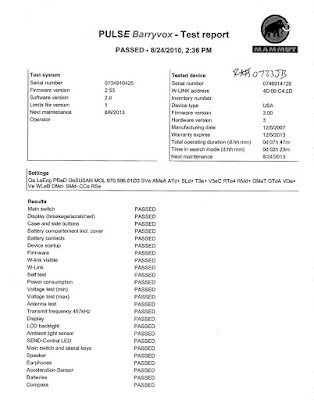 Each category indicated as "PASSED" represents multiple calibrated tests. There are some other related functions of the Fleet Management tools as well as details that are not covered in the scope of this blog—for more in-depth info the “help” menu in the service software is the best place to start. For those who prefer to have the North American Service Centers perform the above functions, all of these services are also available on a fee-basis and can be arranged by calling our Customer Service at (800) 451-5127. We hope this overview of the Fleet Management tools is helpful for anyone in the position of managing a fleet of avalanche transceivers. If any of the above looks useful to you, please give us a call today!